Before Harvey Weinstein, before Roger Ailes, before #metoo -- there was Anita Hill. 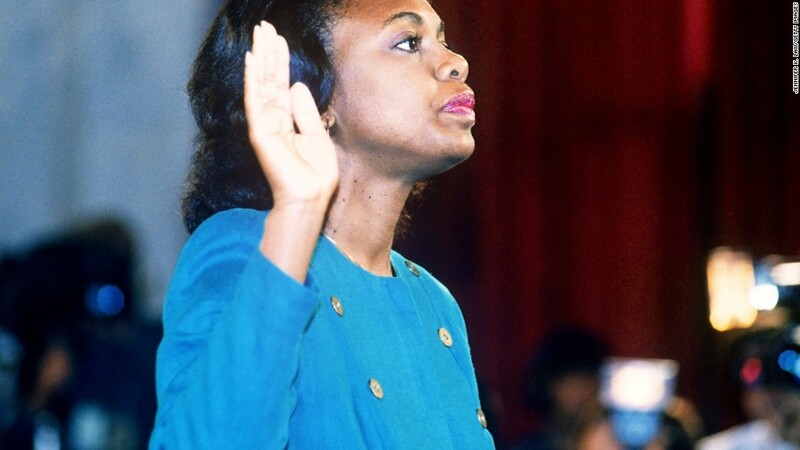 In October 1991, Hill testified about sexual harassment she allegedly endured from Clarence Thomas, her former boss at the Equal Employment Opportunity Commission and then a Supreme Court nominee. Before an all-male Senate Judiciary Committee, she recounted the allegations, sparking a national conversation about sexual harassment: what it is, how it's defined and whom it affects. Thomas was eventually confirmed to the Supreme Court. But after Hill stepped into the spotlight in 1991, her experience forever changed how we talk about sexual harassment in the workplace. A few years before the Anita Hill hearings,18-year-old Jaclyn Friedman started a summer job at an auction company. She knew she had to avoid the boss, who was frequently trying to find excuses to get her alone. When she discussed the situation with her mother, she remembers her mother encouraging her to "do her best" to weather the experience. "There was never a conversation about filing charges or getting me out of there," Friedman says. "I think that she accepted that it was a thing that might happen, and that we were powerless to a certain extent." Watching Anita Hill on television in 1991 was Friedman's transformative moment -- it showed her what she'd experienced was not normal workplace behavior. "That's when I came to understand, 'Oh, what my boss had done to me was not OK, and it wasn't inevitable,'" Friedman says. "It really was not a thing that had occurred to me before then." A decade later, when University of Maine psychology professor Amy Blackstone first began researching sexual harassment, she interviewed men and women about their workplace experiences. The Hill and the Thomas hearings kept coming up. "I was surprised by the number, without any prompting from me, who noted the impact the Thomas hearing had on their awareness of harassment as an issue, and the impact it had in terms of their reflections on their own experiences," she says. Sexual harassment is an age-old issue. But for many, there wasn't a lot of clarity as to what that behavior looked like or what laws or policies could protect women -- until Hill. In 1975, a group of women at Cornell University created the term "sexual harassment" to define these same behaviors they saw in inappropriate work environments. But the term still wasn't widely used in everyday conversation. For two more decades, civil rights lawyers pushed cases through the courts, but women were unable to sue for damages, crucial for many who were risking their jobs to come forward. Just several months before Hill's testimony, the Ninth Circuit Court of Appeals handed dohiwn a decision in Ellison v. Brady, the first case to establish the "reasonable woman" or "reasonable worker" standard, which revolutionized sexual harassment law. The decision suggested that courts try these cases from the perspective of the accuser -- not the defendant, as had previously been the case. It also incentivized employers to provide sexual harassment training. But people still struggled to understand how they could define the behavior -- and women continued to struggle daily as small comments, jokes and more went unchecked. Then Hill shared her experiences with a rapt television audience. The media attention changed everything, according to Merrick Rossein, law professor at the CUNY School of Law. "Her testimony and the attacks on her resulted in a profound national dialogue and inquiry into sexual harassment in the American workplace," Rossein says. "Most people had no idea. They didn't know what the term meant. They'd never heard of it. So after her testimony and the rise in the women's anger, there were surveys and studies throughout the American workplace." And from this combined rise in awareness and anger, Rossein says, sexual harassment awareness progressed considerably. According to the EEOC, in the five years after Hill's testimony, sexual harassment complaints filed to the office more than doubled. In a recent op-ed for The New York Daily News, Hill herself says she still hears from women suffering in silence. Harassment scandals continue to rock Silicon Valley CEOs and Hollywood heavyweights. And even as some women come forward, many stay silent for fear of retaliation. "The most current surveys show that although we've made progress and that many corporations have developed pretty good policies and there's been more training -- the courageous women who complain remain the tip of the iceberg," Rossein says. Correction: A previous version of the story identified Merrick Rossein as a legal history professor. He is a professor of law.